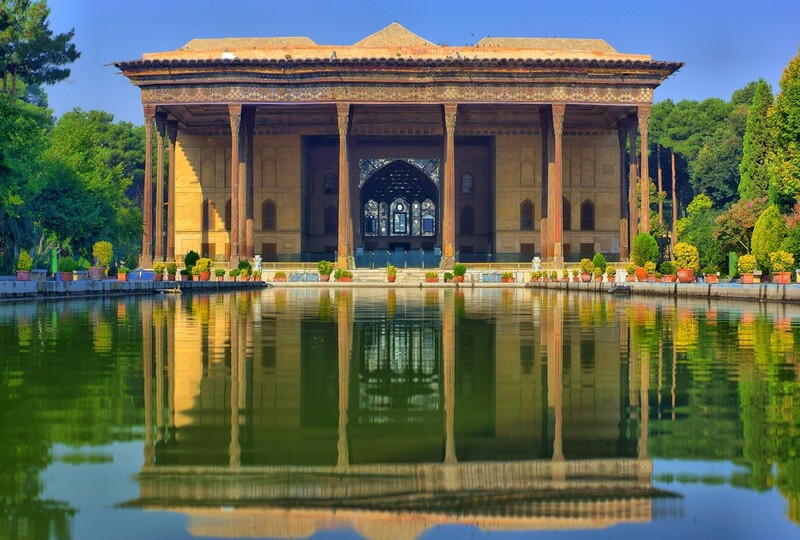 Chehel Sotoun is a pavilion in the middle of a park at the far end of a long pool, in Isfahan, Iran, built by Shah Abbas II to be used for his entertainment and receptions. In this palace, Shah Abbas II and his successors would receive dignitaries and ambassadors, either on the terrace or in one of the stately reception halls.The name, meaning "Forty Columns" in Persian, was inspired by the twenty slender wooden columns supporting the entrance pavilion, which, when reflected in the waters of the fountain, are said to appear to be forty. As with Ali Qapu, the palace contains many frescoes and paintings on ceramic. Many of the ceramic panels have been dispersed and are now in the possession of major museums in the west. They depict specific historical scenes such as the infamous Battle of Chaldiran against the Ottoman Sultan Selim I, the reception of an Uzbek King in 1646, when the palace had just been completed; the welcome extended to the Mughal Emperor, Humayun who took refuge in Iran in 1544; the battle of Taher-Abad in 1510 where the Safavid Shah Ismail I vanquished and killed the Uzbek King. A more recent painting depicts Nader Shah's victory against the Indian Army at Karnal in 1739. 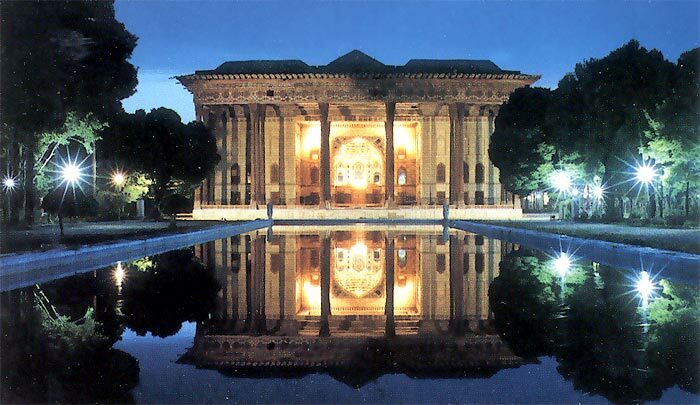 There are also less historical, but even more aesthetic compositions in the traditional miniature style which celebrate the joy of life and love.The Chehel Sotoun Palace is among the 9 Iranian Gardens which are collectively registered as one of the Iran’s 23 registered World Heritage Sites under the name of the Persian Garden.